Sunday: Ride on donkey while crowds shout at me to fight and defeat the world's biggest army. Monday: Kick out the cheats from the temple and get cursed for doing it. Tuesday: Try to teach but get interrupted by tiresome know-all fanatics asking me trick questions. Thursday: Supper with supporters. Nice, but most don't understand me and one plots to betray me. Arrested on my midnight walk. Friday: Whipped, hauled in front of the Roman governor, crucified. Saturday: Wrestle with the devil in hell, or so the myth-makers say. Sunday: Come back alive. I hope. They'll be talking about it in two thousand years if I'm right. But sometimes I think maybe I'm not. It's going to be an unholy awful week. Well Easter has come round again. And I thought I should put this poem up on the blog again. What struck me when I was preparing an art exhibition for the church was how short a time these events took. All in seven days. Whether you are a believer or not (and to my mind this doesn't really matter) the world was changed by these seven days. It is interesting to think what Christ might have prayed on that Wednesday night. A thought I had was that maybe the alternative to him going ahead with the crucifixion was quite simply ending the world just at that moment. "Enough of this failed experiment Father. Let's cut our loses and start again." Anyway since this poem has been on the blog before, here is another one religious one. About how twisted and imperfect people are. Look, you should be blue. Your growth is small and stunted. Your scent bred out of you. Pink Hyacinth I hate you. Pink Hyacinth I love you. I love you for two things. You still remain a Hyacinth. Into shapes and colours that are wrong for us. 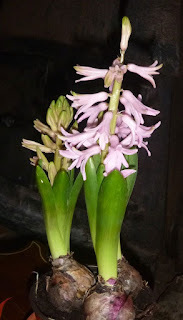 Perhaps God loves men (and me) the way I love pink hyacinths. And a last thought while I am looking through old poems. I often have long talks with my counselor (a very impressive woman click here to read more) about ambition in life. While religions urge us to try to be perfect and to be discontent when we fail, counselors seem to urge us just to try and be more or less OK and make the best of it. The religious view seems too hard, the counselor's view too depressing. Both are speaking to one or other side of the truth I suppose. Anyway here are my thoughts on this tangled matter. Well it's nearly all-right, well it's almost all-right. But it don't seem a target to aim for. For “all-right's” not the life that we came for. There's a truth that we all have to swallow. Anyway, life goes on as usual. Jeanie is putting up some iPad paintings on her blog. We have found a way to show them being built up stroke by stroke and hope to put up a serious video on painting on the iPad pretty soon. Meanwhile you can see a few pics being created stroke for stroke on her blog.